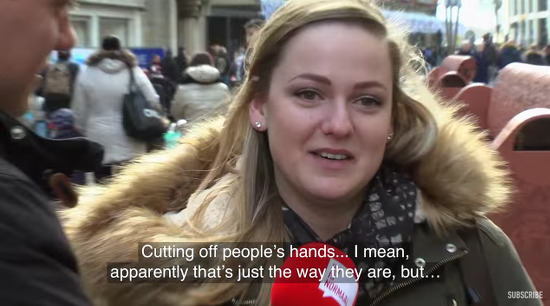 These Dutch pranksters took a bible and disguised it as a Koran and then had people read passages. The reactions are predictable. It's worth 3 minutes of your time to watch the video using the link at the Friendly Atheist blog. This is a bible we don't really know about. Wisely and appropriately, it isn't much read at Sunday services or studied in Sunday school. But the passages are there. I remember reading the ten commandments in Exodus 20 to my daughter at bedtime one night. 4 But if his master gave him a wife, and she bore him sons or daughters, then the wife and her children will belong to her master, and he will leave by himself. 5 Nevertheless, if the slave declares, ‘I love my master, my wife and my children, so I don’t want to go free,’ 6 then his master is to bring him before God; and there at the door or doorpost, his master is to pierce his ear with an awl; and the man will be his slave for life." There are complicated apologia for this from religious thinkers, but the apologia seem to involve saying these passages are "in line with the times" or "progressive for the times" or "that's all the Hebrews were able to understand at the time" -- i.e. making these passages relative to the times in which they are written. Well and good, but should we not approach the passages on homosexuality the same way? We are in a time of overpopulation. We don't need more people on earth. The ancient world is a different story. They needed to populate the earth. They needed more children so they would have enough people to defend themselves against larger tribes. We are in a time of antibiotics. The ancient world has no antibiotics, so some sexual practices would be more dangerous than they are now. I am not going to provide a list. And it is obvious that the temper of the times involves patriarchy / misogyny. This is obviously directed at a male audience, and lumps wife into other forms of property. Of course, by the time I learned the ten commandments in school they didn't express it this way. Following Augustine, the commandments was split into 9 (covet wife) and 10 (covet property). Still sexist, but an improvement. So the Bible (and the Koran, and likely other ancient religious texts) contain a variety of anachronistic passages. We might look for them for inner meanings and inspiration (e.g. Swedenborg's writings), but should avoid looking at them for literal guidance in a world that is much different than the ancient near east.